The North Bend Educational & Cultural Association is a 501(c)3 nonprofit corporation established to support community events that promote local business, provide educational scholarships, and bring people together in service and celebration. Our annual fundraising events are the Spring Scholarship Auction (4th Saturday of March) and the Festival at Mt Si which takes place in on the second weekend of August each year (Friday, Saturday and Sunday). NBECA is a registered charity with the Washington Secretary of State and exists solely as a 501(c)3 nonprofit corporation. Our UBI number is 602 491 052 and our Federal EIN number is 91-1670006. Our nonprofit is staffed entirely by volunteers and donations are tax deductible in accordance with IRS tax rules. Since 1999, when the North Bend Educational and Cultural Association formed to take on organizing the Festival At Mt Si, the festival has been going strong! Everythird weekend in August, the Festival At Mt Si volunteers welcome all to continue North Bend's 60+ year community tradition. Although the festival may have been known by various names over the years, we invite you to volunteer, participate, and help welcome others to celebrate living under Mt Si. NBECA fulfills the educational part of its mission with the Judy K Boyce Memorial Community Service Scholarship. The 1st Annual Spring Scholarship Auction was held in 2016 at the Si View Community Center in North Bend. With the support of our Valley community, NBECA awarded two scholarships to Mount Si High School Seniors. Since 2017, our scholarship has been open to all Snoqualmie Valley School District and Two Rivers graduating seniors. 2018 - 8 MT SI HIGH SCHOOL AND 5 TWO RIVERS SCHOLARSHIPS! We are growing - with your support, we can assist more students in pursuing their goals! The scholarship is open to HS Seniors who have educational or vocational plans after graduation and have volunteered in their community. Additional consideration is given to applicants who have volunteered for the Festival and/or the Spring Community Service Scholarship Auction. You can find more information here with our scholarship description. The Spring Scholarship Auction is the primary event that funds NBECA scholarships. The event includes food and entertainment accompanying a robust program of live and silent auction items. 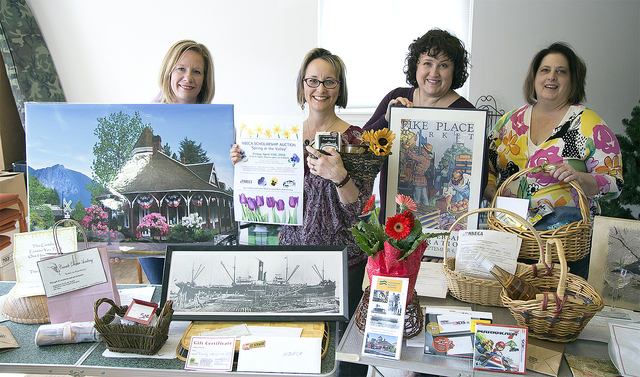 "NBECA spring auction returns to support scholarships, Festival at Mount Si"
"NBECA is the 16-year-old organization more commonly known as the Festival at Mount Si committee, an all-volunteer group. It's also the sponsor of at least one $1,000 scholarship to be awarded to a Mount Si High School senior, starting this year." The Festival at Mount Si is looking for volunteers! Please see our volunteer page for more information. We've added ATMs for your convenience all weekend long!